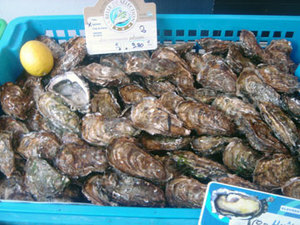 I live on rue St. Antoine, right by the St. Paul metro and I am blessed in having great food shopping on my street. There are three boulangeries, two cheese shops, three supermarkets, two wine shops, two produce & fruit stands, and two foie gras shops (this could only happen in Paris) within a 2-block radius. Next door to me to my right is a boucherie (butcher shop), one of the best in the city. People come from all over for their fine cuts of meat but best of all they have amazing roasted chickens. They put a rotisserie out on the sidewalk and it roasts 4 rows of chicken, which turn slowly on a spit, and on the bottom of it they load a tray with potatoes and they are cooked with the drippings from the chicken. Does that sound delicious or what? There’s only one problem: in the spring and summer when I have my front windows open, the perfume of the chickens roasting wafts up my windows and the smell transfixes me. As I am pecking away on my keyboard, writing my blog stories, the smell drives me to the point of distraction, so eventually I give in and buy a chicken with some potatoes and eat it till I am sucking on the bones. 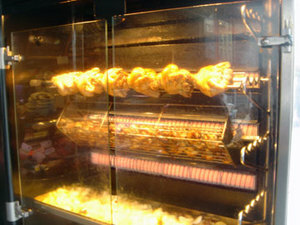 Roasted chickens - can you smell them? 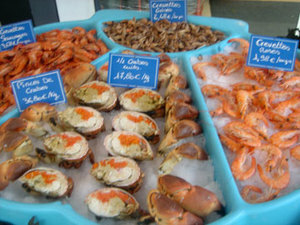 During the winter months, a fresh seafood stand is set up on the left side of my door every Friday, Saturday, and Sunday. Thankfully it’s winter, so the delectable salty sea smell of the fresh huitres (oysters), mussels, and gambas (shrimp) doesn’t make its way up to my window. Delicious roast chickens to the right of me, delectable oysters to the left of me, what to do! Such are the hardship s one has to endure when living here. C’est la vie! Is that butcher's shop the one that also sells horse meat? 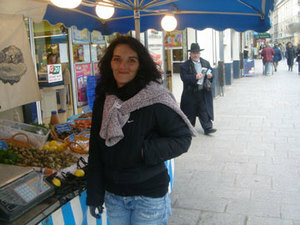 I recall a boucherie chevaline on the south side of the rue St. Antoine, at least it was still there last winter. That's a delightful stretch of street. On the north side, there's still a cheap old hotel whose sign advertises "Eau chaude, gaz sur tous les étages" or something similar. I think most of my food photo come from within a block of your place, Richard. So happy to see all the press you are getting these days! 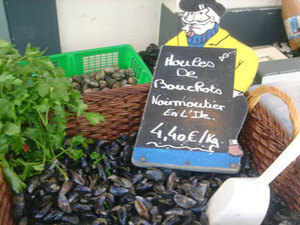 do you know the name of the restaurant on the corner of rue saint antione and st Paul? Any time? Hello! We just got back from a week stay in this wonderful area! We stayed on Rue Beautrellis and ate at the wonderful Vin de Pyrenees. I personally loved L'Arsenal though for their hospitality and great atmosphere. I am hoping to find some information about a certain boutique on Rue Saint Antoine called Tanag. There is a ring that got away that I would love to order but I just cannot find any information on the web. Any help that anyone has to offer (address, phone number) would be highly appreciated!! I forgot to mention that Tanag is just a couple of doors down from Nicolas (wine) and I think fairly close to the Monoprix. Crossing fingers and thanks! Does anyone know the name/address of the pearl earring jewelry store? Think "Girl with the Pearl Earring." It's on the north side of the road. I lost an earring and would like to replace it.